I picked up a copy of Frans Bengtsson’s The Longships without necessarily expecting very much of it. I’d had it recommended to me by an impeccable source, and I needed to immerse myself in all things Viking as part of preparation for a new book on Fenris’s finest, but first impressions weren’t good. The edition I own has one of the worst covers of any book I’ve ever seen (pictured in all its soporific glory). Someone’s even blogged on how ugly the English-language editions of this book are. I noted its length (over 400 pages, very dense print), that cover again, and wondered if my time wouldn’t be better spent elsewhere. Swedish readers of this blog will be rolling their eyes about now, smug in the knowledge of how fantastic The Longships is. To be fair, it has the much cooler title of ‘Red Orm’ (Röde Orm) in the original, and I daresay the covers have a bit more energy about them too, but even in translation the book turns out to be utterly wonderful. First published in the 1940s, it was (and still is?) a huge hit in Sweden. The prose takes a while to work its magic – it’s consciously written in the manner of an epic saga, and for the first few pages comes across as strangely stilted. Soon, though, the chapters start to flow by and the genius of the storytelling emerges. It’s very, very funny (in a remorselessly dry Scandinavian way) and, despite the characters being prone to regular bouts of drunken violence and motivated almost entirely by the pursuit of money, women and alcohol, surprisingly touching too. Bengtsson’s style has made me think a lot about the craft of writing. The Longships has two characteristics that would make it, I think, almost unpublishable today: a pared-down, virtually adjective-free prose style, and a complete absence of an inner psychological narrative for the characters. Everything is on the surface: either told straightforwardly by the narrator, or given in actions and speech. Writing successfully in this way, despite its naive aura of simplicity, is very hard: nothing is wasted, nothing is superfluous, there are no short-cuts. It’s traditional story-telling shorn of narrative tricks and literary flourishes – and it’s marvellous. Reading it is like greeting an old friend after many years apart and finding that they’re just as wonderful as you remembered them being and wishing you’d found a way to stay in better touch. I enormously admire craft like Bengtsson’s, perhaps partly because it’s such an unfashionable way to write in a post-Joyce world of tricksy, story-free literary hocus-pocus. In a recent interview, the author Will Self said that ‘I don’t really write for readers. I think that’s the defining characteristic of being serious as a writer.’ By contrast, Bengtsson reportedly said that ‘I just wanted to write a story that people could enjoy reading, like The Three Musketeers or the Odyssey.’ To my mind that’s a far tougher and more impressive ambition. In The Longships he succeeds magnificently – if you’re as ignorant of the book as I was, I recommend trying it out. You may have noticed that there hasn’t been much in the way of posting here lately. That’s partly due to my typically-late discovery of Twitter, and also due to a new regular commitment to posting on the BL Blog every month. Oh, and writing books and things. Given all of that, I’m giving a bit of thought to what to post here. Unlike some authors, I’ve never really used this blog to post about non-work things, and I’ve also not written much about writing in general. I might reconsider both of those things a bit from now on. There’s also some in-the-pipeline stuff I’m dying to talk about, but can’t just yet. As soon as that changes, you’ll read about it here first. I’ve now written two books in the Space Marine Battles series: Battle of the Fang, which featured the Space Wolves going up against the Thousand Sons, and Wrath of Iron, which had the Iron Hands taking on a Chaos insurgency on a hive world. For the time being at least, that makes me unique in Black Library authordom. Everyone else has written one of them then retired, exhausted, before doing something else. This is sensible. It turns out that writing Space Marine Battles novels is very hard work – of all the books I’ve written for Black Library they’ve been by far the toughest to finish. They’re all about the action: the explosions, the void battles, the duels, the hordes of horrors surging up to the gates. A wiser writer than me once described them as ‘summer blockbusters’, which hits the nail pretty much on the head. They’re fast-paced, brutally violent, and full of Space Marines doing awesome things against impossible odds. Sounds fun? Well, hopefully it is, at least to read. In writing terms it’s a big challenge. Penning action scenes that aren’t repetitive or formulaic is tricky. The goal is to orchestrate the action so that everything makes sense and the reader can get a clear picture of what’s going on while trying to keep everything moving at a clip and also building in some kind of character work so the whole thing isn’t just a mindless whirl of bolter rounds and shouting. Which is easier said than done. 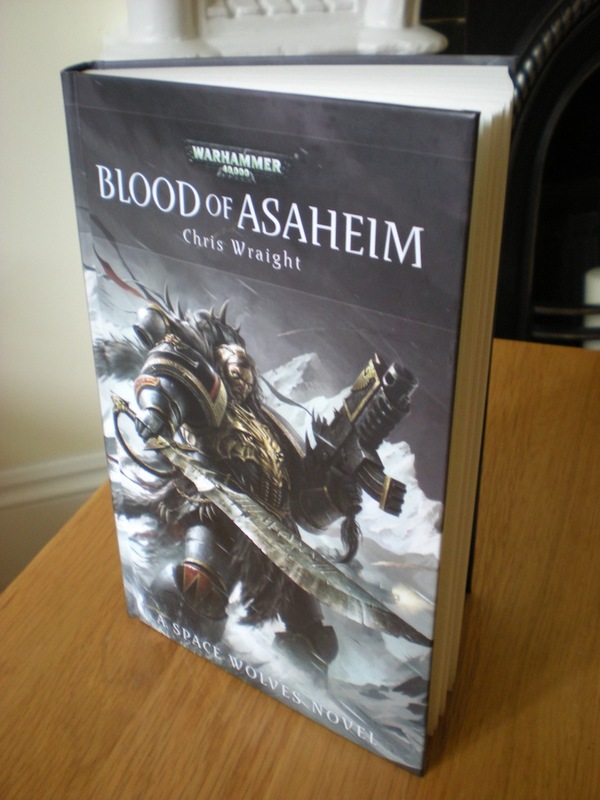 Space Marine Battles novels are stories, after all, not just expanded battle reports. I think the key, as another wiser writer told me once, is to remember that it’s all about the characters. That’s why plenty of the Space Marine Battles novels, despite being ostensibly about superhuman killing machines, feature lots of unimproved humans too. In Battle of the Fang we saw a lot of the action through the eyes of two mortal warriors, a father and daughter duo who had very different views of the masters they served. In Wrath of Iron there’s even more focus on the non-Space Marine actors: several Imperial Guardsmen, a civilian, a Titan crew, a member of the Adeptus Mechanicus, and so on. In fact, in Wrath of Iron, the relationship between the Iron Hands and the mortal soldiers on Shardenus is really the point of the book. The battle is important, sure, but I was really concerned with getting across just how alien and interesting the Iron Hands are, and what implications that has for the Imperium and its future. That’s ultimately what makes the Space Marine Battles books, for all their difficulty, so satisfying to write and such a privilege to take on: the chance to explore the variety of Chapters out there and to delve into their psyche while all the grenades are flying. There will always be plenty of action in these books (just as there should be), but it’s not just about the fighting. So, despite what you may have been told, it turns out that in the grim dark future there is quite a lot more than only war: there’s hope, despair, perfidy, heroism, elation, depression, and plenty more besides. Squeezing all that into a story while making sure the body count keeps ticking over – therein lies the magic. From Medusa to Nottingham. And back. It’s been a busy couple of weeks. I managed to get a fair bit of writing done after getting back from Adepticon, but last week saw me heading up to Nottingham for a top-secret meeting of Heresy-types, followed by a series of meetings and other stuff in the murky bowels of HQ. I’d love to blog about what was discussed, but that would sadly bring my short career with BL to an untimely end. It was exciting, though. I’ve seen things you people wouldn’t believe, etc. etc. Aside from that it was nice to spend a couple of hours at the Warhammer Doubles tournament on Saturday, where we had copies of Wrath of Iron on sale for the first time in the UK – thanks to all who came up to buy a copy, get a signature, or just say hi. The book is only just up for preorder, but that hasn’t stopped the reviewers from getting hold of copies. Take a look here to see what the Independent Characters made of it, and here for the review on the Founding Fields. There’s also a great review from the Lost on Fenris blog, a site which is new to me. I’ve updated the 40K page with some of these reviews. 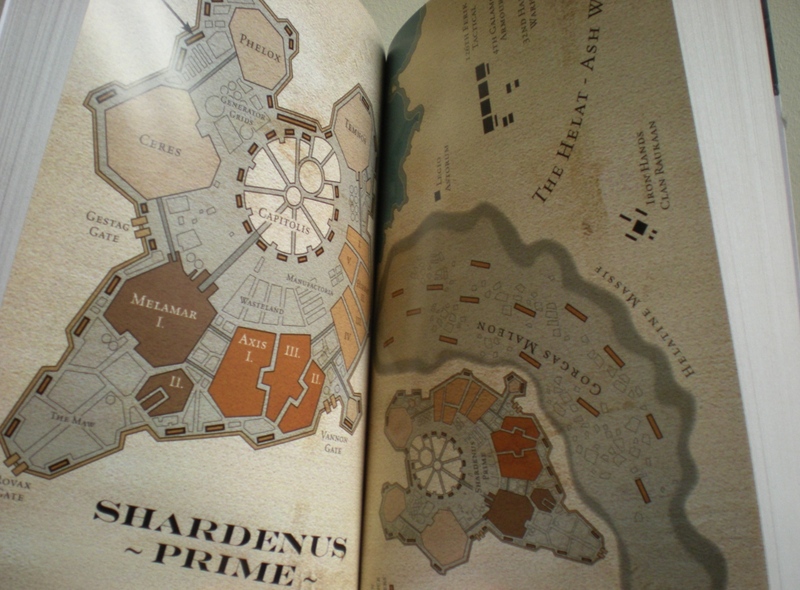 Look – it has pretty maps! All reviewers mentioned how dark this one is. I guess that’s likely to be one of the key responses, both from those that like the book and those that don’t. The bleak tone was deliberate, made in order to be true to the Iron Hands’ background (as I see it). Hopefully those that enjoy their grimdark will appreciate the story, and, as ever, I’ll be very interested to hear what Iron Hands players/readers make of their favourite faction’s depiction. There’s a short blog entry over on the BL site with some more thoughts on this. And of course there’s also Flesh available, which gives a pretty clear flavour of how the Sons of Manus get depicted. What else is new? I’m keeping busy with a few concurrent projects right now. One of them is an audio drama for the Horus Heresy line, another is a brand new 40K novel, and the third is a limited edition novella. Once Nick Kyme has recovered from his recent jaw implosion (get well soon, Nick!) I’m sure I’ll also be turning my thoughts to the War of Vengeance series too. So, plenty to keep me occupied. In the meantime, it’s been nice to see my short story Kraken get some attention: the super-busy Independent Characters have posted their review here. So that was Adepticon 2012. My first experience of a major gaming convention, as well as first time in Chicago. Now back in rainy England and with several hours of sleep under my belt, I can start to make some sense of it all. First off, Chicago is amazing. It’s got all the architectural interest of New York but with a bit less dirt. We were lucky with the weather, and everything sparkled. Millennium Park, the Field Museum, the Art Institute – they were all superb (and huge). I can’t really see myself ever upping sticks and living anywhere but the lovely West Country, but if I did then Chicago might be a contender. Some bits look like Gotham, others like Necromunda, and others like Coruscant. The whole place is very sci-fi, which makes it a splendid location for Adepticon. Lombard, the suburb where we were based, is slightly less awe-inspiring (unless you like car parks), but the hotel was very swanky. We needed somewhere to recover after a hellish wait at O’Hare’s passport control and an amusingly suicidal taxi ride along the freeway. I’m sure it’s not entirely safe to drive while reading a hotel directory and talking on the phone, and I think it’s generally agreed that staying in lane at least some of the time is sensible. Still, we made it. The Emperor of Mankind. And statue. We were pretty busy the whole time. Thanks to all who came to the round table seminars and who visited the Black Library stand in the main hall. Good to chat, as ever. Adepticon was a little different to events I’d previously attended, in that it was primarily a tournament gaming event rather than a mix of hobby and book stuff. I don’t think that really changed the atmosphere much: perhaps people were a bit more earnest than I’m used to, with fewer casual fans hanging around, but there was plenty for the non-gamer to enjoy. The armies, to my eye at least, were painted to a fantastic standard. I was particularly chuffed to see the winning entry in the Black Library competition, which was a Heresy-era Thousand Sons force. This included two named characters – Temekh and Aphael – who both appeared in Battle of the Fang. Great to see them immortalised in plastic, and congrats to the Capital Imperialis team from Springfield, Illinois for such a splendid job (they were very nice guys, too). We were kept busy with signings on all three days, and it was especially pleasing to see copies of Wrath of Iron making their way into the hands of readers. After all those long nights hammering away at the keyboard, it was a good feeling to see the finished article released into the wild. I was accompanied in the stand by fellow authors Clint (C.L.) Werner and Andy Smillie. The latter is a relative newcomer to the fellowship of BL scribes whose debut stories can be found in the Gotrek and Felix anthology and as part of the 15th Anniversary celebration collection – well worth checking out. I’ve long been familiar with Herr Werner’s fantasy books as a reader, but it was my first chance to meet the man himself, and it was an absolute pleasure. As well as being a fan-favourite author, Clint is a real gent, and I hope our paths cross again in the future. In the meantime, as well as the Skaven-tastic Dead Winter, you should definitely look out for his upcoming Siege of Castellax Space Marine Battles book at the end of the year – it’ll be stellar. So long, Chicago. We barely knew ye. Thanks must also go to Eddie and Mike from BL, who looked after us marvellously and worked furiously hard to keep up with demand on the stand. I hope they’ve both managed to catch up with some sleep and recover in time for planning the next one. Thanks to the guys from the GW Chicago Bunker who helped out and were cool to chat to. Honourable mentions also to the various podcast people and bloggers we met, all of whom were reassuringly enthusiastic and full of questions. It was a memorable, surprising, friendly, exhausting trip away, which is, of course, just as it should be. Roll on Canada.